Gold leaf can add that authentic feel to any project. Used traditionally to gild frames, mirrors and interior molding, gold leaf is now used in mixed media and crafts as well. Choose from a variety of finishes, from the inexpensive metal leaf to the real stuff at 23 karats. 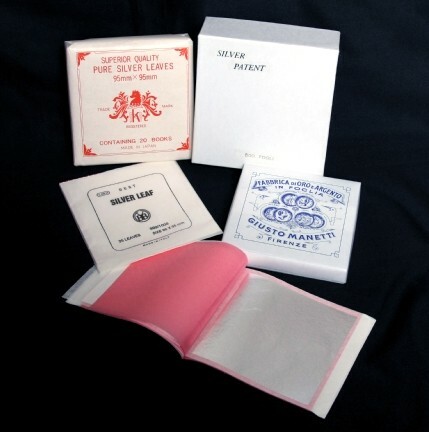 We have carried the save brand of the finest quality Italian made imitation and real gold, silver and copper leaf for over 30 years. This is the highest quality metal leaf available. Consider that not all metal leaf is equal, and should be a factor when comparing prices. Please note that due to the rapid movement of gold and silver prices can change daily. The prices for our real gold and silver leaf will be honored if possible, but due to fluctuations in pricing which is beyond our control prices are subject to change at anytime. If there is a change in any prices once you place your order will we of course contact you to seek your approval before processing any order. Thank you for your understanding.